This plate was issued to the Shelby assembly facility. The "1-E" on the left side of the plate changed with each car, starting with 1-A, 1-B, etc. 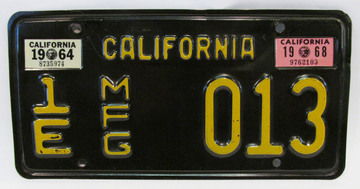 "MFG" was used for all California manufacturers plates. "013" stayed the same on all plates issued to Shelby.